A Trinket from Every Town! Some say that money makes the world go round, and Golarion's merchants make this a reality. 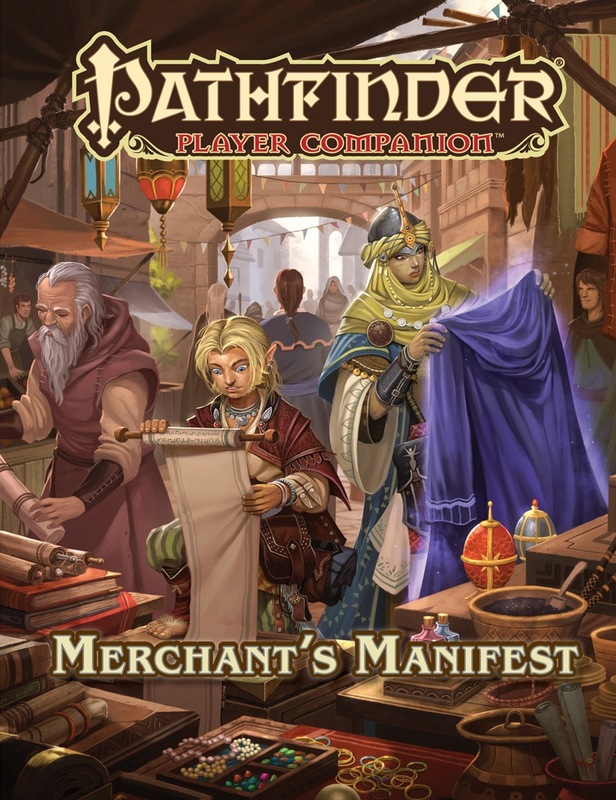 Pathfinder Player Companion: Merchant's Manifest examines commerce through the lens of important trade hubs such as Absalom, Goka, and Katapesh, where smart shoppers can secure myriad fine wares. Whether you're aiming to purchase a rare item, hire on with a trade organization, or make your fortune on your own, this player-focused volume is your key to success. A look at 17 key merchant hubs on Golarion, including key settlements such as Cassomir and Port Ice in Avistan, Anuli and Kibwe in Garund, Ular Kel in Casmaron, and Goka and Ordu-Aganhei in Tian Xia. Dozens of magic weapons and armors, mundane items, and wondrous items that originate from these key places, plus information about the markets in which they are typically found. Archetypes and other class options geared toward characters who are merchants, who work for merchants, or who have a personal history tied to commerce. In comparison to the Adventurer's Armory 2, which I was more cool about, this book recaptures that feeling of a treasure box of neat and interesting items. Attack Badger Plush? Check. Parasitic rebreather fish? Check. Mechanisms powered by alchemical heat rocks? Check. Candles that also double as food? Check. The only gripes I have with the book are relatively minor and in no real way detract from the material in the book itself (apart from the Paladin archetype, which trades out a bit too much power for very minor boons). Definitely worth a read for all the interesting ideas the book brings out. Announced for March! Product image and description are not final. Hm! More downtime rules for shops perhaps!? I hope we get a map of trade routes here. This should be an interesting book. How about rules for price fluctuations so you actually can make a profit off merchanting? I hope there's at least a few rules here that relate to the rather underutilized downtime system. That will never be the focus of the game, but it would be good to see a little something for it every now and then. Please let this include a revision of prices and regional market variations for those prices, or just some better logistical options for the potential siege and or kingdom management of the upcoming Taldor Campaign. 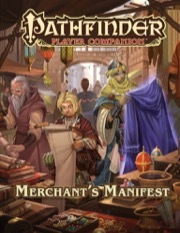 I had hoped to see a product on the topic of trade, but in the Pathfinder Campaign Setting line. Oh well. If this updates the city stats of Absalom & Katapesh (which only had "Pathfinder Chronicles" releases) & has a map of Goka, i'm interested. Still, it makes sense to put the three settlements with the highest population number in the book. Probably not going to be interested in this.
. . . Unless it's the book where we finally get a world map.
. . . Or if it includes tools for fighting Kalistocrats. I can't say i'm really all that interested in fantasy economics. Will there be any archetypes in this? First two pages are marketing jargon, after which the book becomes Ultimate Aspis. 0.5 internets to the first who gets the reference. If not, I'm happy if there is something neat in the centerfold. I like stuff such as the maps in the People of... series and Faiths & Philosophies. That was a Merchant's Guide that definitely blew minds! I remember people being upset that it wasn't ACTUALLY an in depth book on the economics! I'm still hoping FFG decides to release a 5th edition using R&K but bringing in a few ideas from the Narrative Dice System. Nothing to see here, just unimportant peasant conversation! On know direction awhile back James Jacobs discussed always wanting to do a golarian almanac. I wonder if this represents a development of more projects like that. Hoping it is similar to Dune Trader from the old Dark Sun Line. I would like to one day see an actual world map of Golarion. Getting an Inner Sea Almanac off the ground has been weirdly tough for lots of reasons I'm not gonna go into here. Having trade information in this book is one way to get that out there for folks without having to wait for an Almanac that may never actually happen to happen, though. Excellent. My Chaotic Good Bard will now have rules on how to hunt and kill capitalist exploiters. Fight the power! Umm, so bit late, but what book are you two referring to? "...okay, that's enough about that. Now that we have scared away the easily bored people, it is time to get to the point. This is not a treatise on Rokugani trade. This is the Kolat sourcebook." Kolat was the L5R version of the Illuminati/Hydra/freemasons. It was a consipiracy run by ordinary humans, with the intent to get rid of practically every divinely-inspired clan and concept that subjugated the peasants, including the entire samurai class and the Emperor. It was the most secretive organization in the entire setting. It had to be. If it became known, any other faction would have tried to exterminate it forthwith. I think it was a fairly late addition to the setting. It gave the metaplot a severe kick, revealing some important NPCs as secret masters behind the Kolat. A rough comparison would be a Pathfinder sourcebook that revealed that Razmir was set up by Rahadoum to discredit religion, or that Abigail Thrune I was actually a priestess of Calistria who sacrificed herself to get Hell to overextend itself in order to get revenge for some slight that happened when Rovagug was being wrangled into Golarion. I liked most L5R sourcebooks. Especially Way of the Shadow, which still creeps me out. I can't wait for this! I love these kind of books. I've always wanted to do a campaign where the characters establish their own merchant house and trade empire form the ground up. A mix of the travels of Marco Polo and the rise of the Medici and similar families during the Renaissance. Books like this are instabuy for me. Oh this is going to be really useful or my Kingmaker retool,finally a more realistic economy and trading system to incorporate with kingdom building. I think you might be having unrealistic expectations if you are expecting more realistic economy simulation ._. t be fair 'll be happy if it just rebalances the prices of trade goods, a pound of black pepper should not be cheaper than a chicken in the sort of economy Golarion has and I'm more looking for details on orchestrating trade deals anyway. @ StarMartyr365 - "I can't wait for this! I love these kind of books. I've always wanted to do a campaign where the characters establish their own merchant house and trade empire form the ground up. A mix of the travels of Marco Polo and the rise of the Medici and similar families during the Renaissance. Books like this are instabuy for me." This would be ideal if the character makes investments in trading expeditions throughout the world. I would also ****LOVE****LOVE****LOVE****LOVE**** to see a companion sourcebook detailing investment opportunities for our characters to put their money to work for them. I have seen some stand alone articles on investments especially the February 2000 Dragon article by Kevin Haw which discussed investing for characters. I made a post about investments in the Homebrew thread that may get some traction with the members. Will we get either a list of key trade routes or a couple of map pages (for avistan and garund) with directional arrows and names of goods? Count me as one of those who are interested in this one! Major trade routes (including which commodities get traded in which direction) would be good. Naturally, PF city stat blocks for other cities are also welcome. What about Darklands trade hubs? The updated product description has got me interested in this one now. Nice cover. :) That blue cloak really suits Kyra. :) Also yes, this sounds even more interesting than previously thought. Kyra does not seem certain about that blue cloak, however. I’ve found Occultist to be remarkably useful as a merchant class- they automatically identify items, as well as getting a bit of history (useful for telling if something is looted off a fresh body). I’m hoping they get some love, but Silksworn is sufficient if not. I'm cautiously optimistic. The last time there was a companion book focused on (for lack of a better description) purely roleplay scenarios it turned out surprisingly well. Got my Pending notice! PDFs should begin arriving next week. This seems like it might be similar to the Adventurer's Armory books with respect to new 'stuff' but giving us background on the people/locations these things come from. Excited to see it! looks like PDF arrival dates are missing from the new website? I just see the order button. A book about merchants? And its a player companion? Oh please let there be anything in there that makes item crafting more wonderful! That is all I want at this point.